Tiger Muay Thai and MMA training camp fighters in Phuket, Thailand racked up a 3-2 record over two nights in Patong on September 21 and 24 at Patong Muay Thai Stadium. Kathleen won her fight by KO in the 3rd round. She showed good technique her hard training gave her the edge bfore she even stepped in the ring. Yodbuaphet won his fight on points and continues to improve as a fight. Ritt ost his fight in 4th round suffering a shoulder injury. Mark had his best fight for Tiger Myat Thai to date as he fought a pitched battle for 5 rounds before catching his opponent with the elbow KO fo the win. Mark is in great shape taking private lessons and working hard on his technique and proper fighting skills. Great fight Marl. Robert Lek returned to ring in a rematch losing a close fight on points. Look for the grudge match sometime in next two months. Tiger Muay Thai and MMA training camp has a large schedule of fights coming up in the next month. 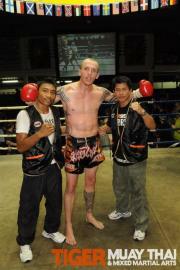 Check out all the Tiger Muay Thai trainers and guests in their fights in Patong. Discount tickets available in the office and at guest relations guest.